Many years ago, I was a troll hunter and my brother was a collector, so imagine my excitement when I came across “The Troll Cookbook” by Karima Cammell and Clint Marsh! Let me begin by saying that modesty aside, I am an awesome cook, and have been cooking since I was 10 years old as a child of an Italian family filled with restaurateurs. Anyway, although I was captivated by this unique idea, I was actually very interested in exploring what of kind of cooking trolls would do. The book looks elegant in a rustic troll-y kind of way. I loved that it is a hard cover book and that the pages are thick enough to withstand a lot of use in the kitchen. The book begins by introducing the reader into troll culture, before exploring the different recipes presented for each season. 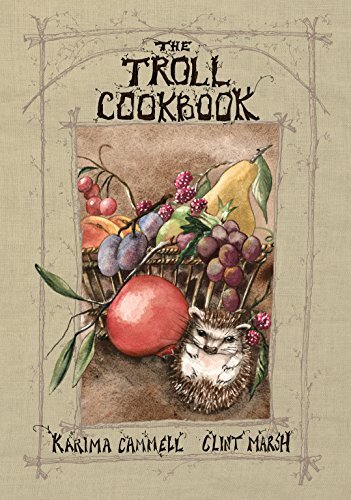 The beautiful troll art included throughout the book creates the perfect ambiance for the succulent and simple troll cooking. I did find surprising how natural and simple most of the recipes were. I tried few of them such as the Egg Noodles and Noodle Soup, the Roast Leg of Lamb, and the Lentil Soup. I must say these felt Mediterranean, yet there are many others, which I will try next that I have not heard of before, like the Coffee Can Cake. Cammell and Marsh did a wonderful job creating the ultimate conversation piece by the fusion of troll culture and cuisine. From the wonderful art, awesome tales, stories and troll history, to creative dish names and yummy recipes, this well written and creatively designed cookbook entertains, informs, and creates a unique experience with each recipe. Overall, “The Troll Cookbook” by Karima Cammell and Clint Marsh is for sure my favorite book this year; one that I will keep, cherish, and revisit on many different occasions. Five Stars for Good Old Troll Cooking!